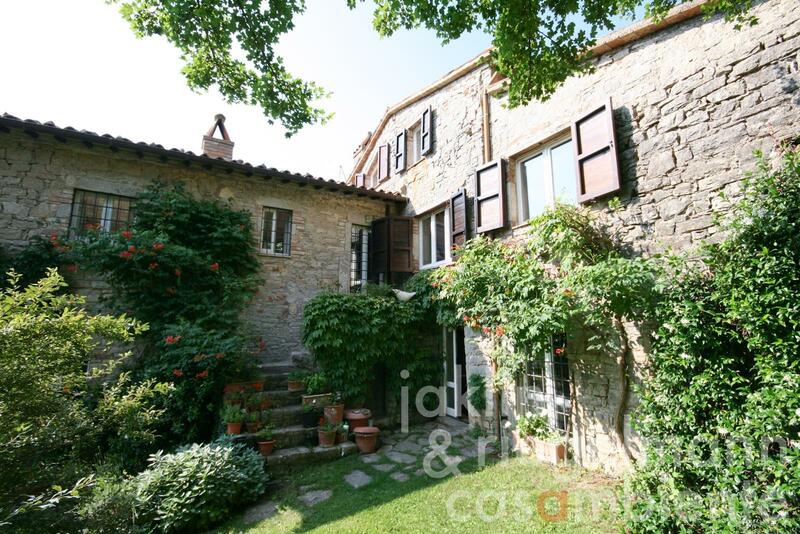 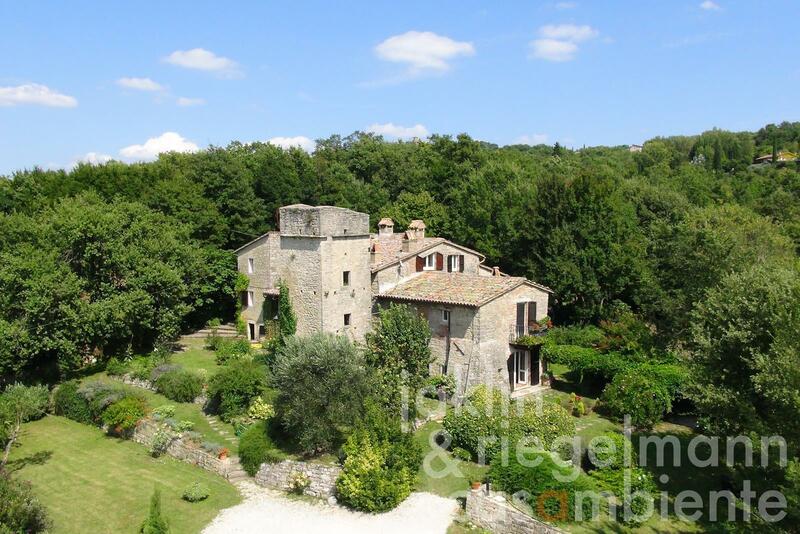 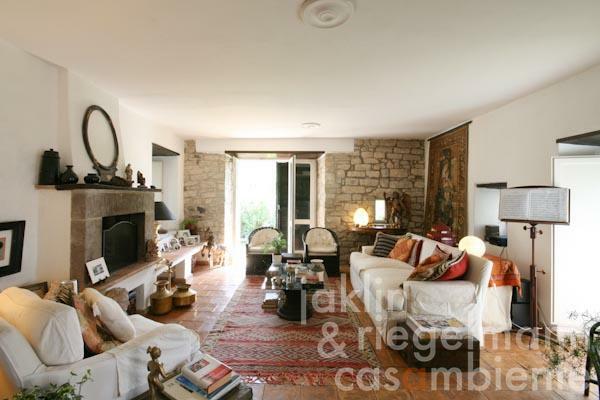 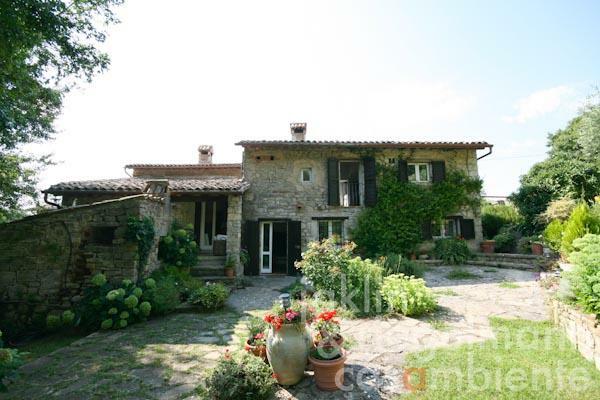 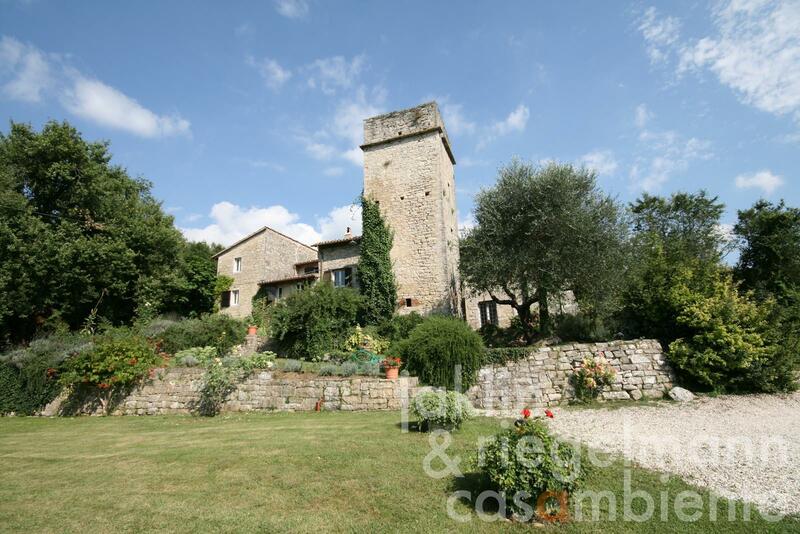 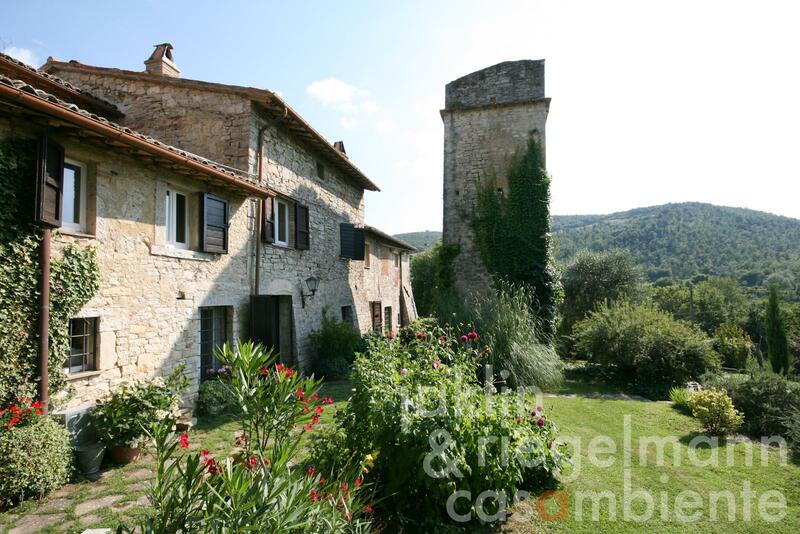 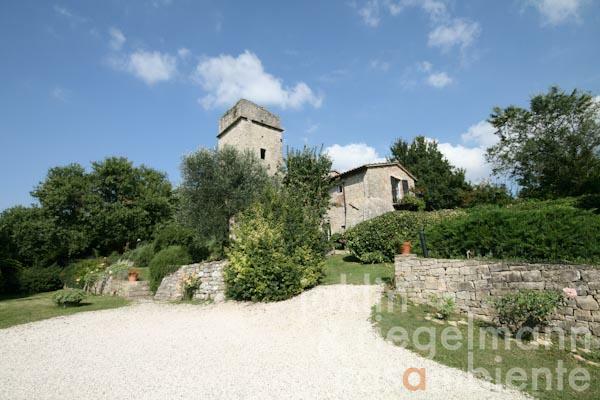 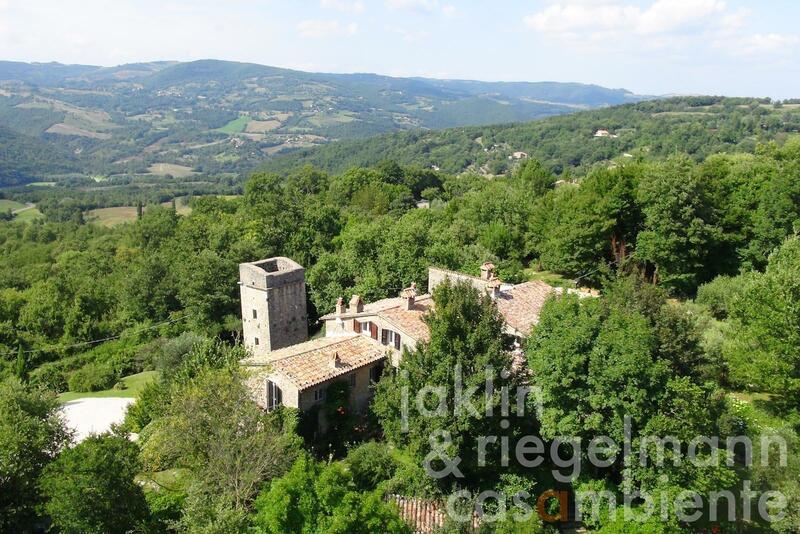 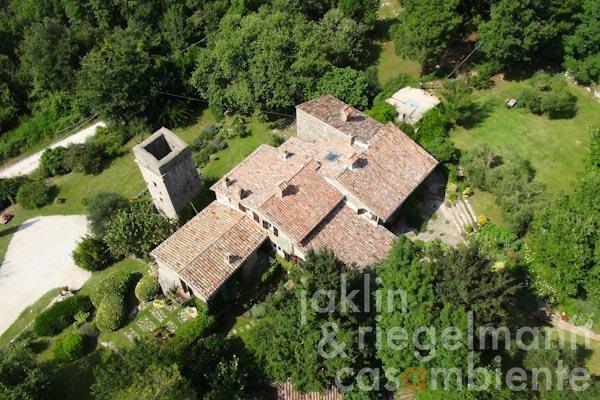 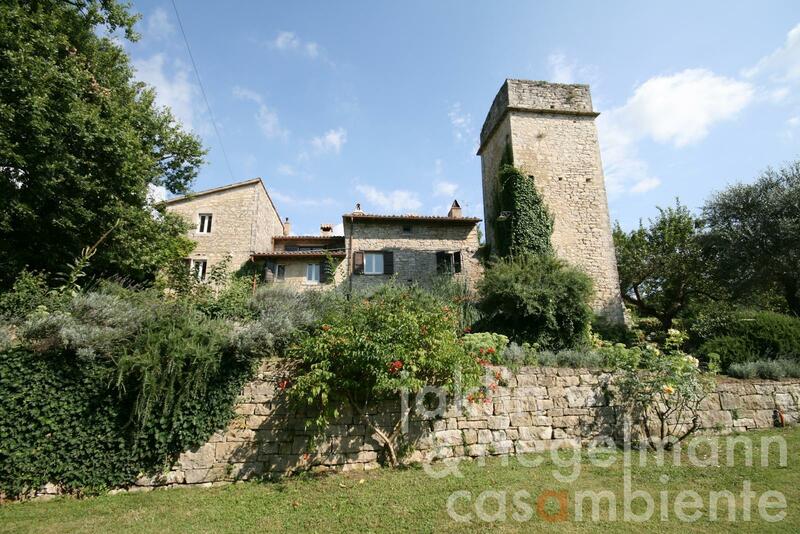 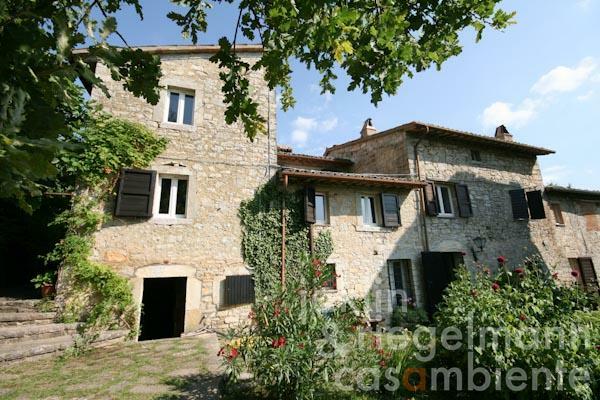 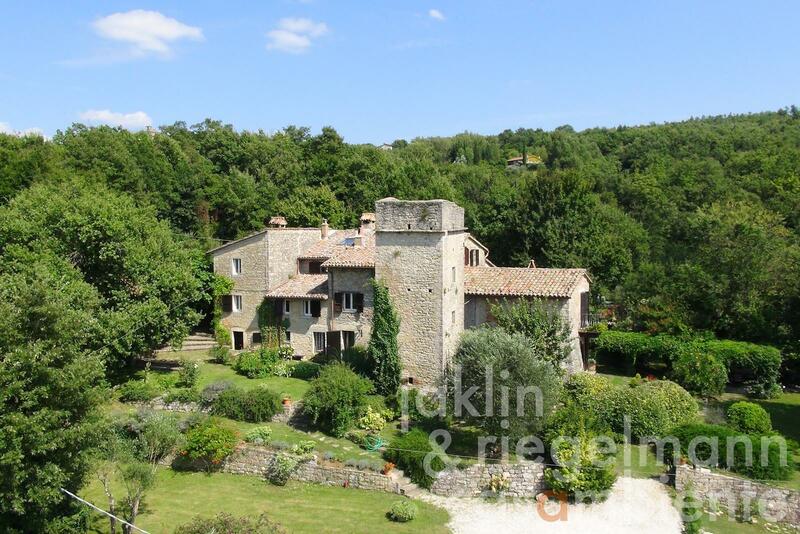 This ancient farmhouse for sale between the towns of Orvieto and Todi in Umbria is flanked by a watchtower built before the time of Dante Alighieri. 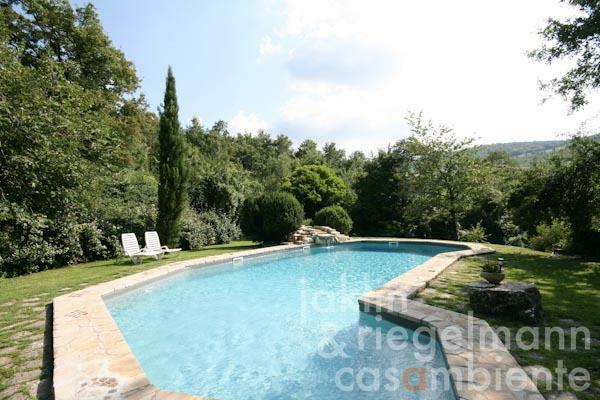 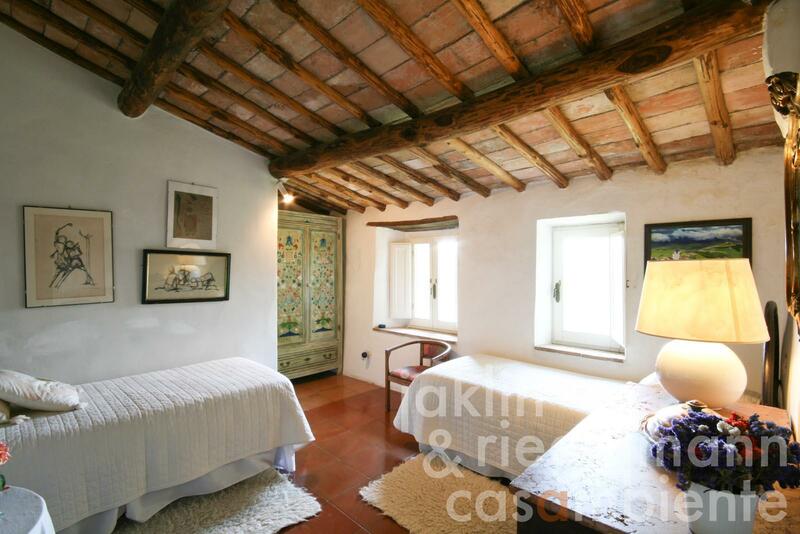 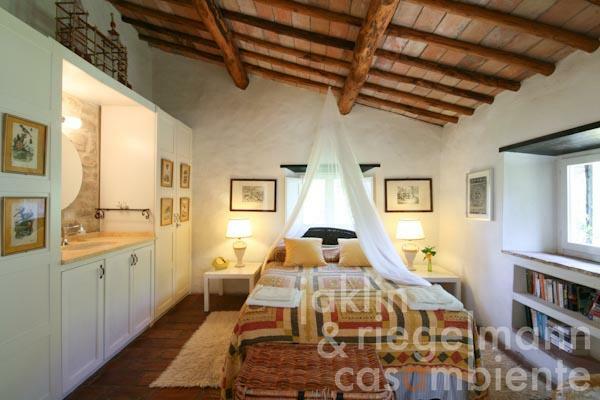 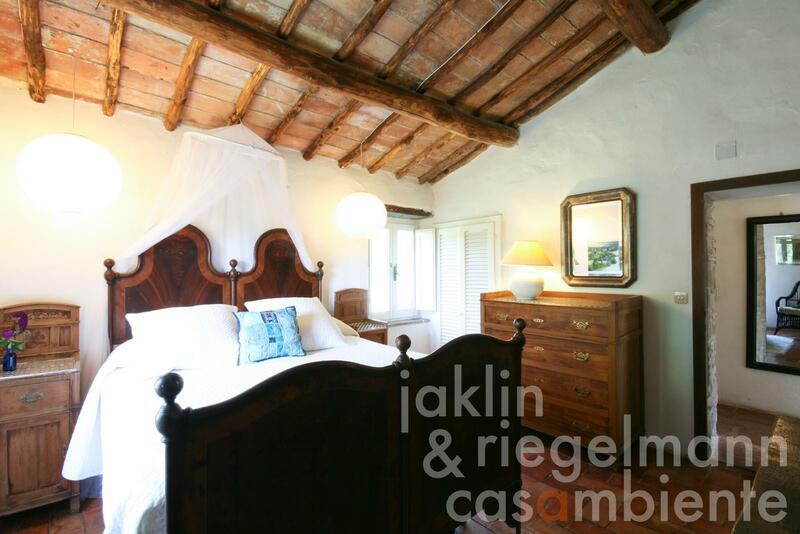 The large, carefully restored rustico in the stunning Umbrian countryside offers panoramic views across the hills. 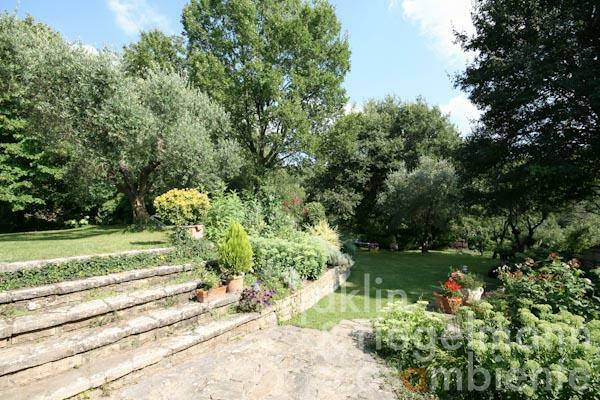 Set in the midst of a well-kept garden, with a discretely placed, gated pool, spacious lawns and terraces, it has a shady pergola with views of the setting sun, and three outside lunch and dining areas plus a barbecue and wood-fired oven. 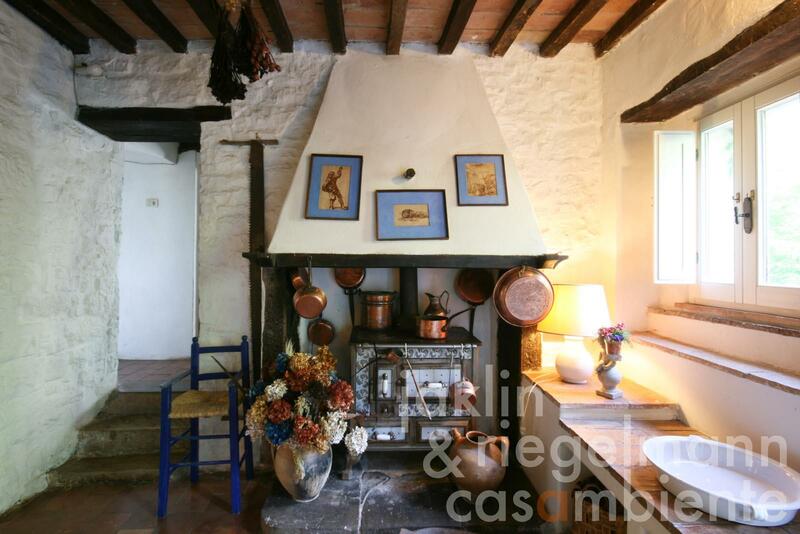 The former home of several peasant families is now one house that can be divided into two by closing a single door. 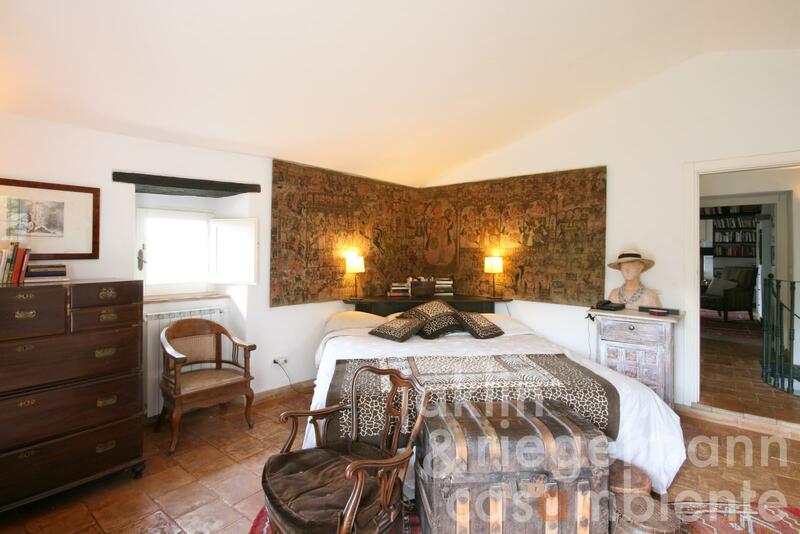 The six bedrooms, five bathrooms, two kitchens, two studios, two living rooms are highly comfortable for a couple, but also for large groups of family and friends. On the ground floor there is a kitchen with pantry, a living/dining room with two fireplaces and access to the first floor studio and bedroom. 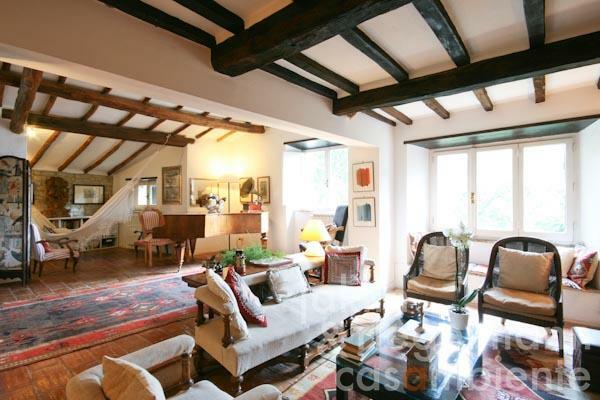 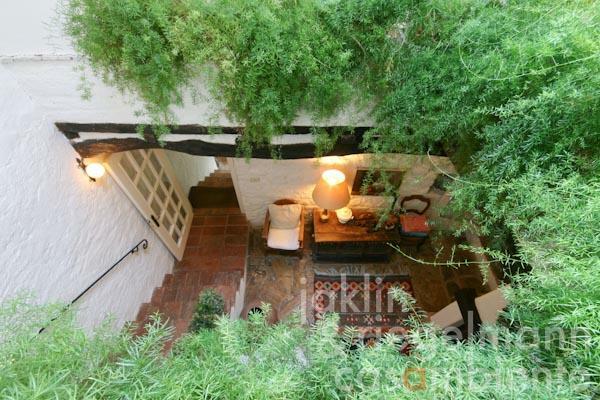 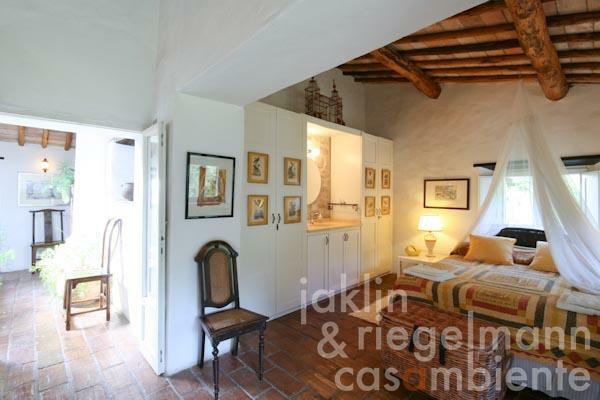 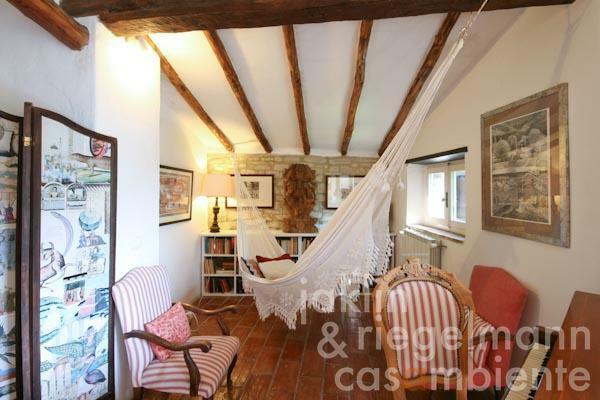 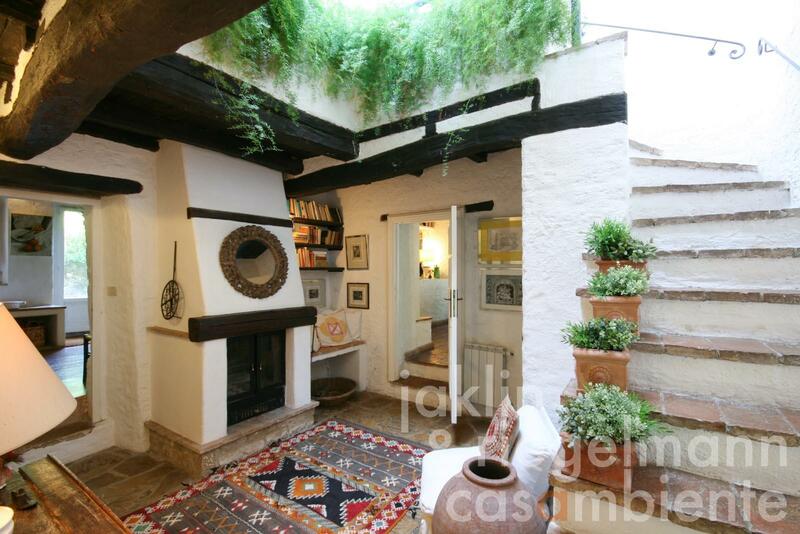 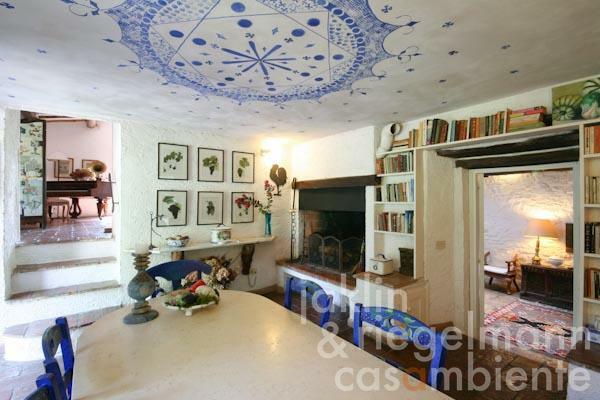 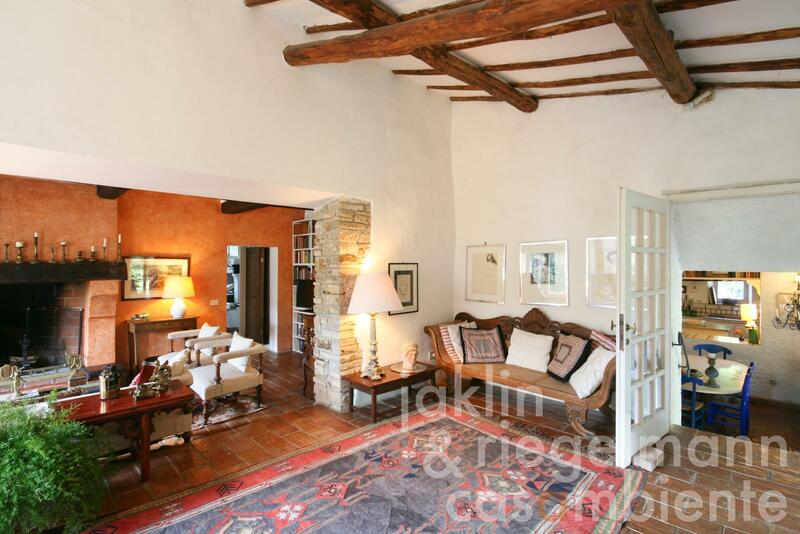 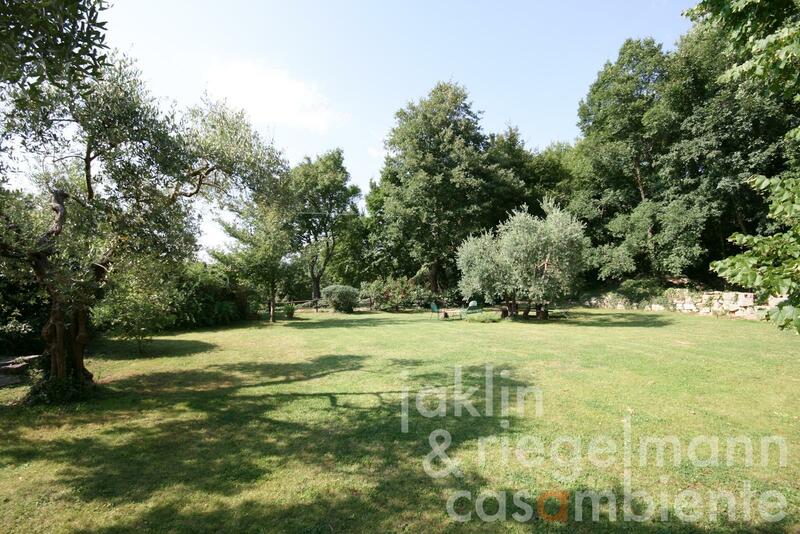 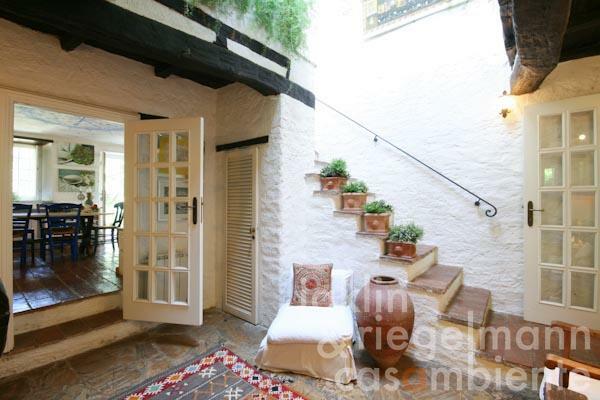 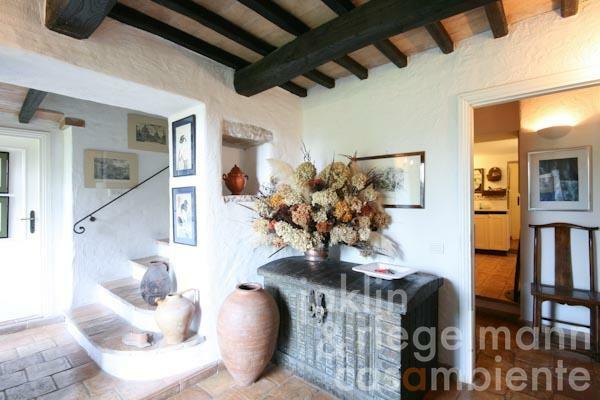 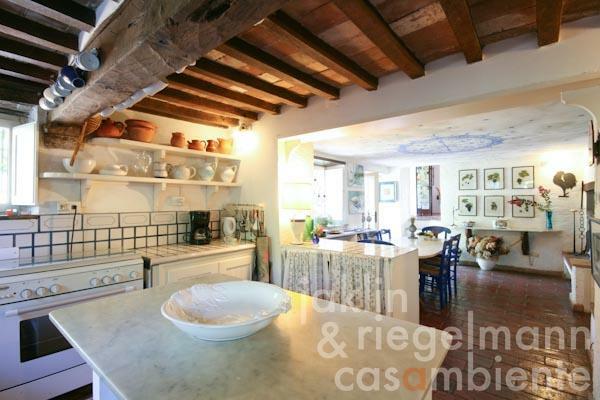 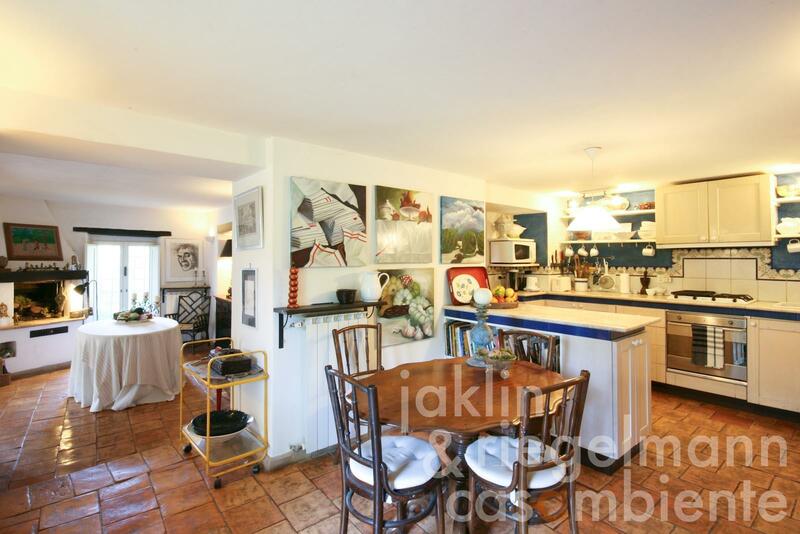 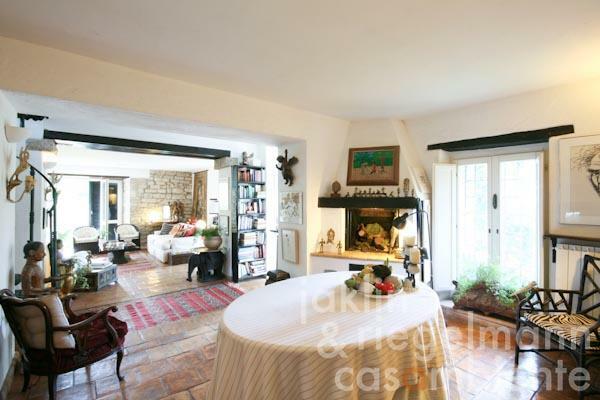 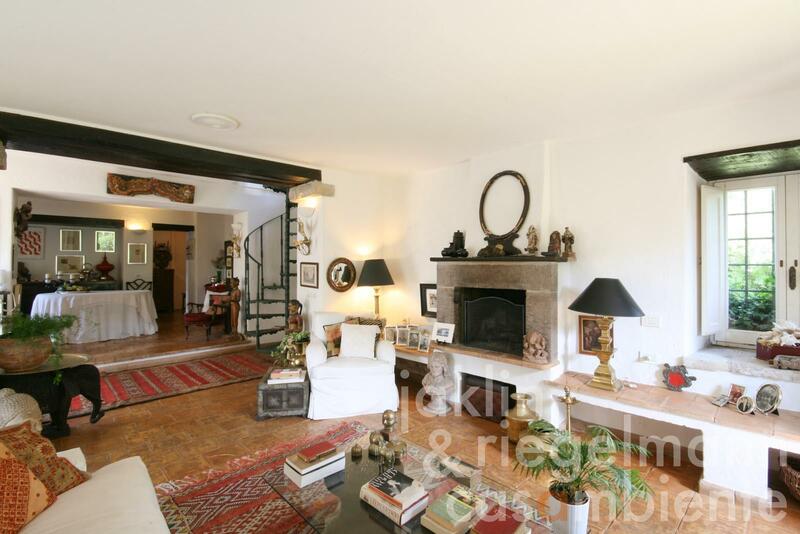 Next door, the main entrance leads to a lovely atrium on the first floor, a second kitchen and dining room, a large living room with fireplace, both with access to the upper garden and the wood-fired bread and pizza oven. On the second floor, there are two double bedrooms, a shared bathroom, and a third double bedroom with its own bath and adjoining study. All have lovely views. 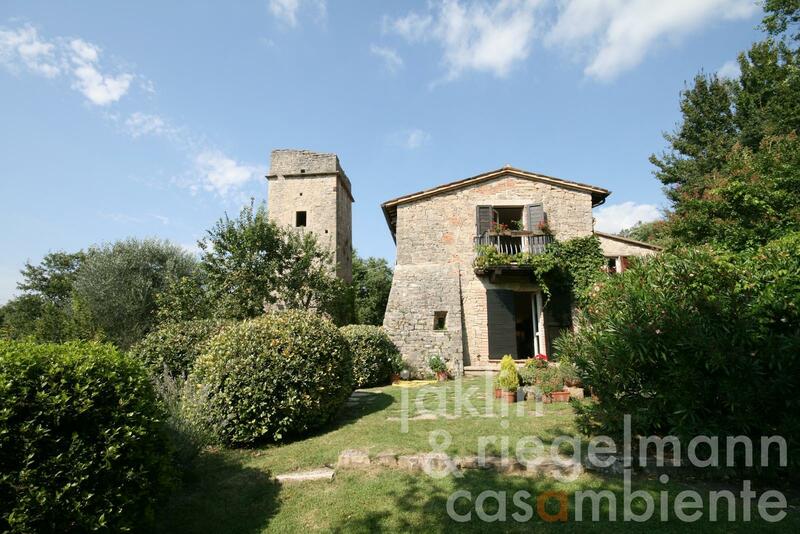 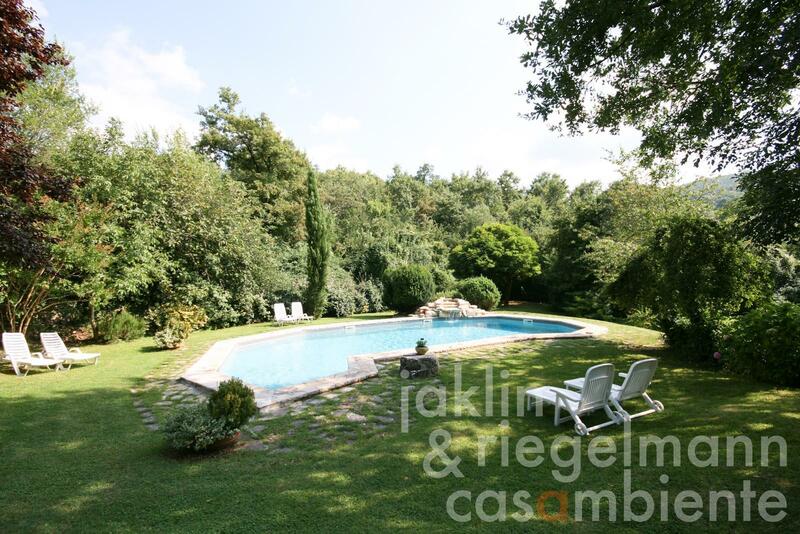 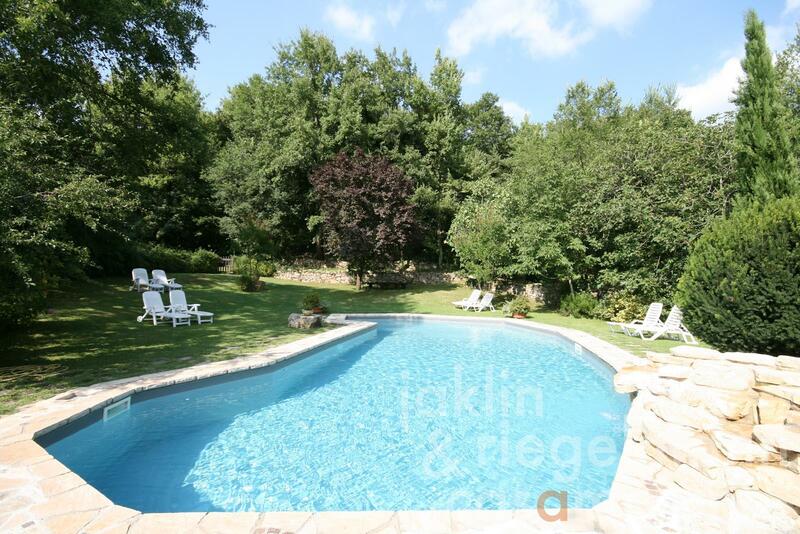 The property has its own water source, central heating, a large subterranean garage and a new photovoltaic system. There are plans for the restoration of the detached tower. 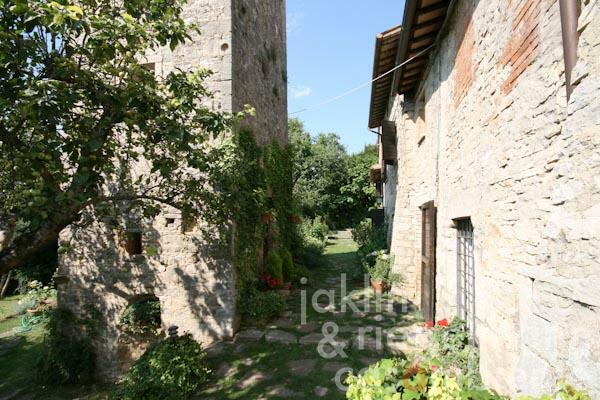 The nearest village is 7 minutes away, has a little restaurant and a bar. 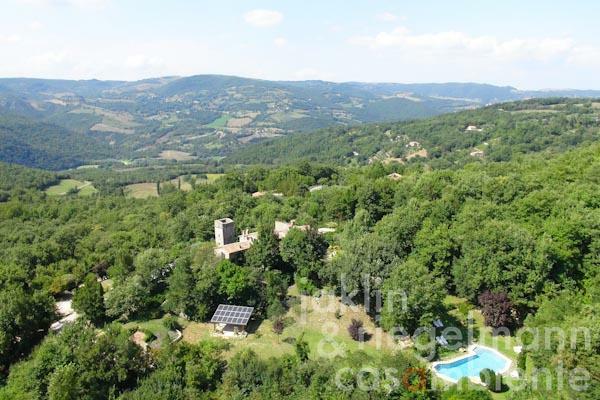 Todi is 20 minutes away, Orvieto 30 minutes. Assisi, Spoleto and Perugia (jazz concerts, classic music, opera) are about 40 minutes drive. Italy, region Umbria, province Terni, municipality Baschi. 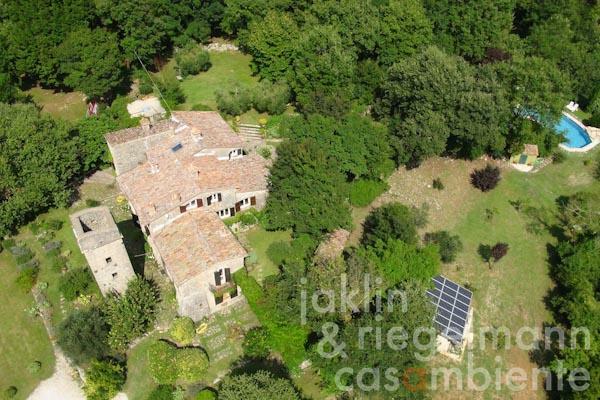 Electricity, photovoltaic modules, own well water, rain water cistern, central heating, fireplace, gas tank, telephone, broadband internet access, satellite-TV, swimming pool, balcony, garage, private parking, terrace, garden.